I’m stepping into a new role this year and I’ve already found myself getting pulled into the Binder Planning Model. You know the one, where the entire year is laid out in the binder, and you’re just turning the pages. To me, it’s a metaphor for school planning in general. In schools, we like to organize our thinking around binders. A sequential entry of to-dos, dates, events and directions for everything that happens throughout the year, from day 1 to day 185, in one place. 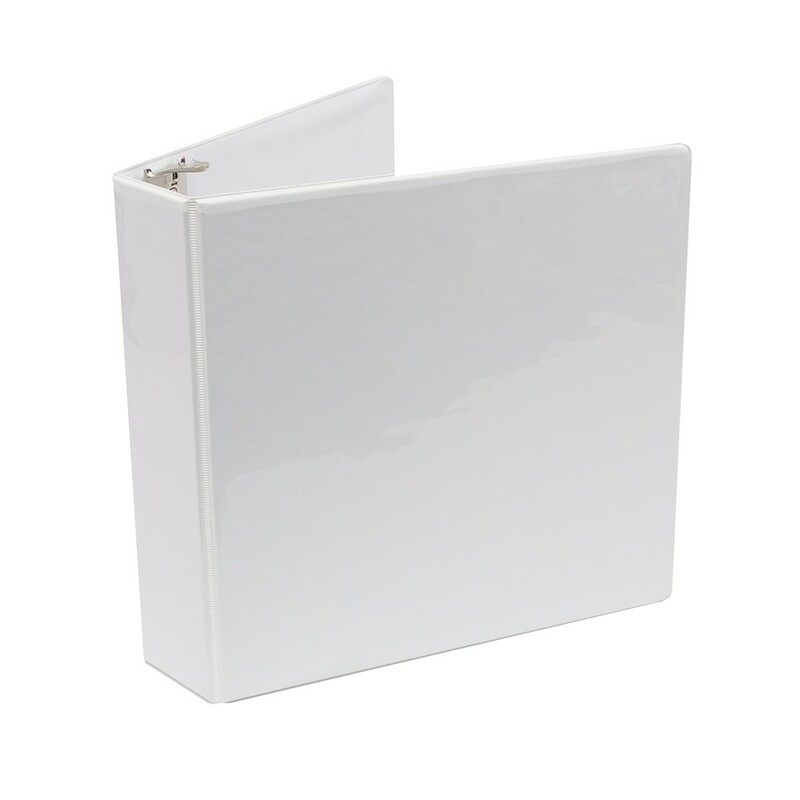 A binder, sitting on a shelf, within arm’s reach at a moment’s notice. It’s a practice that has perpetuated for generations. One which reminds me of that old teaching adage, “Teach 25 years, not one year 25 times”. When I was new to teaching, I was handed a binder for the year and told, “here you go”. I dutifully took one look at it, realized it was mostly out of date and set about rebuilding the content from the ground up. The one thing I took from the binder was the general course outline. I put that outline into an online learning management system (Moodle at the time, I pre-date Google Classroom) and proceeded to pull in a ton of relevant content from many different sources, which I continuously updated, modified and adjusted every year. Just as I didn’t want to fall into the same routine in the classroom year after year, I don’t want to fall into the same administrative routines year after year now. Yes, new standards come along and new regulations are passed, and we dutifully update pages in the binder to keep current (we all do that, right?). But the binder format itself is limiting. It’s hard to adapt and update multiple copies with fidelity. It promotes sequential thinking and “sticking to the plan” even in the face of obvious need for adaptation. The binder models a “gate keeper” mode of information sharing that doesn’t apply in the connected world we now live and work. Granting access to multiple people requires lots of manual intervention (copy and send the green pages, replace page 20 with green 20, etc…). The content remains locked away on a shelf, unsearchable, and only referenced by a few. It’s a planning tool from the 20th (19th?) Century. We need a new planning model for the 21st Century. What if we threw away the binder and every year we had a conversation about what we should do, how we should do it and why we should do it. What if instead of a binder, we had a live planning document, a shared google doc accessible to the entire staff. A scrolling sea of infinite planning possibilities. What could we accomplish if every year there was a blank slate with a running history of the years before. Not a pre-set script to be repeated, but a knowledge base on which to build and transform for they year ahead? I think it’s time to move the annual department plan from a binder to a collaborative planning doc. I’ll let you know how it goes. I can’t even imagine what it would be to start the year with time to build lessons from scratch – It would be so nice to have a little time to evaluate what to keep and what to get rid of. Wow!! I absolutely love this idea!! I use Google Docs, and Google Forms in my classroom with my students. My teaching partners and myself have a google doc that we share and it is a wonderful way to collaborate and share ideas!! I was even thinking more along the lines of creating a Google folder teachers across the nation could add to for their specific grade level or subject. Think about all the amazing ideas that would be posted from people all over the globe. Love your post! Thanks for sharing! What do you think a STEAM program should look like for kids? This is an excellent list! One more thing I would add…student directed. Engaging STEAM programs allow students to explore what fascinates them most about a certain topic. I have experienced this every time I give students the opportunity to direct their learning. Currently, my students are working on providing a solution to the IDEO Challenge to reduce food waste. Students are developing the 4Cs as they explore, innovate, design and iterate. Their path of learning is determined by what has sparked their curiosity. It’s also a blast to teach this way since I learn throughout the process. I am always curious to see what students will create. There was a trap we found ourselves falling into back in the STAR testing days with data. We spent the majority of our time and energy focused on the kids just below the line. The ones close to being proficient. The ones that theoretically should be easy to move. That was how we (and many others) moved district wide performance and attempted to avoid the dreaded PI (program improvement). Targeted intervention with a subset of kids. The bubble kids. For many districts it worked. But the unintended consequence was that it left lots of kids behind. I will never forget a principal at a school in a district I won’t name who told a group of parents that only kids that scored just below the line were eligible for their after school support programs, because there was no point in providing services to kids that were so far below the line they wouldn’t be able to move enough to count. Straight up. Seriously? I’m writing this in part to remind myself not to fall into the same trap. All kids deserve our very best. Not just the one’s closest to a line on a test. I have a new title. It’s a mouth full and when people ask what it is, it actually takes my brain a few seconds to spin up to say it. On more than one occasion, once I get it out, people have commented that it’s kind of cool or that it’s different. I tell them it’s totally made up and that basically I’m now responsible for Tech and EdServices. People generally get it from there but I find the initial pause interesting. Learning & Innovation seems to throw people for a loop. As opposed to a more traditional title with Educational Services or Curriculum & Instruction in there, both of which carry a pre-existing set of expectations. Learning and Innovation are both in there for a reason. They both have purpose. Because while I don’t personally think titles make much of a difference, they do carry a message. The words in Titles can remind us of what’s important and where our focus should be. Learning because as a school district we should be about Learning. Student Learning. Teacher Learning. Principal Learning. Staff Learning. Parent and Community Learning. School should represent a hub of life long learning in practice. Innovation because thanks to the Internet, the world we live in is smaller than it’s ever been and as a consequence, it’s changing must faster than it ever has. Innovation because in our part of the world (Silicon Valley), Innovation is in our community’s DNA. Innovation because it promotes outside the box thinking, reflection and analysis of process and goals and practice. Innovation because learning isn’t about standing still, it’s about moving. So I’ve got a new title and more responsibility, but really, it’s just put a label to what I’ve been all about for a while now, Learning and Innovation. 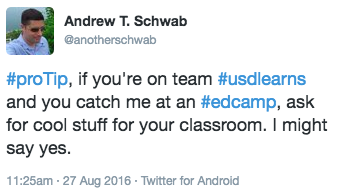 I was reminded this weekend why I love edcamps so much. After a challenging few weeks in a new role, I was very much looking forward to a relaxing weekend of sleeping in and tinkering around the house when a calendar pop up reminded me that edCampSFBay was less than 12 hours away. I took one look at the 8am start time, quickly backwards mapped the 40 minute drive up to Notre Dame High School and figured I’d have to wake up around 6:30 to get their in time for coffee and bagels. On a Saturday. After a long week of back to school. I started coming up with excuses not to go but seeing how I’d missed the last few edCampSFBays, I set the alarm, woke up early on Saturday and headed out for an edCamp, SFBay style. I’m glad I did. From 8-3 (and for about an hour more at the after party), I was reminded why edCamps are awesome. I had a chance to catch up with some #eduawesome folks in the morning, sat in on a session about flexible learning environments and makerspaces in one of Notre Dame’s pilot furniture classrooms, caught another session about using Video academically with the one and only @rushtonh and then was in a great session about learning support for ELL, SPED and GATE students. All this before lunch! Rather than being tired at the end of the day, I was refreshed. A day of sharing and learning was just what I needed to reflect and recharge for the days ahead. Far from being an exercise in effort (although getting there took some), edcamp was a welcome state of mind. 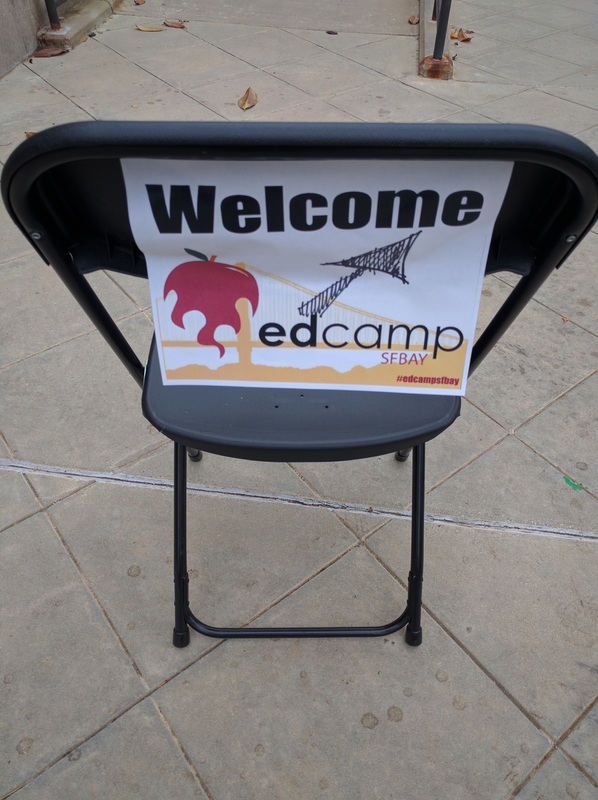 If you are an educator and you’ve never been to an edCamp before, go. If you’re like me and it’s been a while, go. CUE Rockstar Camps and big conferences like ISTE are cool, but there’s just something about sitting in a room having a conversation and sharing ideas that’s so darn powerful. Andrew, I’m so glad you could come. 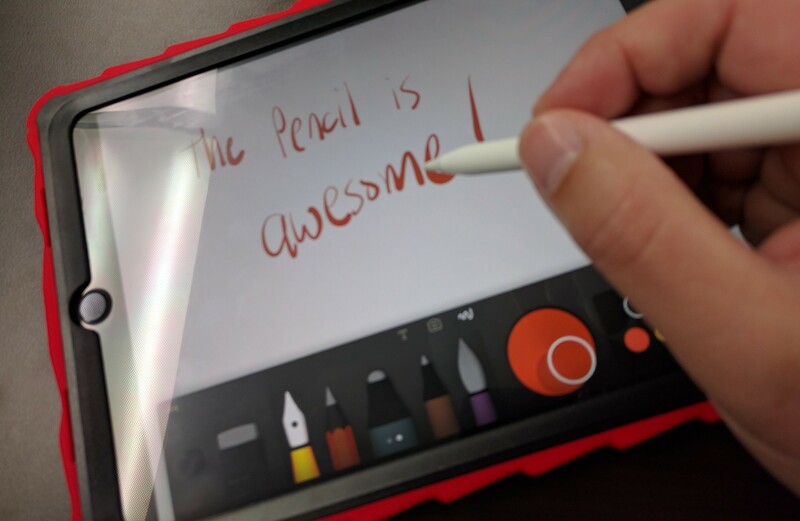 This was one of the most valuable EdCamps experiences I have had. The educators were all so dedicated and passionate about teaching and learning. I spent 8+ hours making connections, learning tips and tricks, and forming new ideas. I would love to stay connected as your district and my school continue to change our learning spaces with different furniture! It’s been almost two months since I wrote about my Inbox Zero experiment and I am happy to share that I’m consistently hitting Inbox Zero every day. It does take some work but as an added benefit, I’ve been limiting my “email processing” to 2-3 times during the day so I am not constantly stuck in email all day (I do respond in real time from my phone, however). The system held up during a conference, which is usually when I get buried, keeps the weekend email manageable and survived a flood of back to school emails. I cleared out all my backlogged Stars and now use them for those high profile action items. I’ve also added a few To Do labels for my team so I can follow up on assigned tasks (team task management is the next big thing to crack). My “Needs Action” label has been working great. It’s the first place I go in the morning to see what I can knock out and it’s the last place I go in the evening to see what’s on the plate for the next day. I like the system I’m using now. It’s simple and it works. If the Gmail app for Android supported Send+Archive, I think it might be perfect. I’m in no hurry to jump into Inbox right away. Maybe I’ll enable it on my personal Gmail account (cause it’s still a mess) and give it a go there.